Two wonder products that can change the way you clean your home. Disinfecting our homes is an important routine. We do this to keep our kitchens free from unwanted guests, our bathrooms smelling fresh and our bedrooms as cosy and clean as possible. The rest of the house will also benefit from these tips and tricks with two main products. White Vinegar is a disinfectant disguised as a condiment. Using White Vinegar in your rental home can help to keep your home clean and safe for the little ones playing in the living room and the bigger ones working hard in the study. White Vinegar can be used throughout the house to clean in a non-toxic, eco-friendly way that will keep your house clean and green. The number one question when it comes to cleaning with vinegar is, “Will my new luxury rental home smell like a Fish and Chip shop?” Well the answer is no, it won’t. Using vinegar in the house needs some care and attention and a few drops of common sense. Try diluting your new cleaning product in water to help dissipate the smell while keeping the potency and effect there. White vinegar can be used in the kitchen to clean stainless steel hobs and ovens, on the mixers of your kitchen sink as well as a general disinfectant for bacteria making it perfectly fine to use in the bathroom. Vinegar fights mould without the horrible results of bleach, so keep a spray bottle with diluted vinegar in your walk-in shower or near your free-standing bathtub. Apart from being a fascinating helper in the house, vinegar also very economical and biodegradable so it does not hurt your pocket or the environment. Washing Vinegar down the drain, toilet or using it to clean your car rims does not harm anyone or anything. It might have you craving some chips though. TOP TIP: if you’re looking to give your rental home a good clean from dust and allergies, pop some White Vinegar into your bucket, the dust sticks to the spirit and collects it on the surface of the water in your bucket. Nifty! Cheap, non-toxic and a multi-purpose tool, bicarbonate of soda is a handy powder to keep in your utility closet. Bicarbonate of soda or baking soda is a naturally occurring product found in organic life, its properties make it safe for consumption (don’t go wild, a teaspoon in your dough is more than enough), medicinal uses (belly-aches disappear in minutes) and the entire purpose of this article, cleaning. Keeping bicarbonate of soda in a spray bottle with water is not the smartest move if you are planning on storing it in your kitchen cupboard, this is more of a prepare for the specific use kind of product. The chemical reaction between the water and the bicarbonate of soda creates effervescent bubbles that attack grease and grime by completely removing it from the dirty surface. Take your kitchen hob for instance; after frying the chips you craved from cleaning your bathroom, the hob must be covered in specks of oil that if left unattended will stick and spread onto your shiny stainless steel hob. Your landlord would not be impressed. Mix some bicarbonate with water to create a paste and layer it onto your kitchen hob, give it a wipe and hey presto your kitchen hob is once again restored. Combining both white vinegar and bicarbonate of soda is match made in heaven. The almost violent reaction that these two non-toxic agents produce is a wonder domestic cleaning products exist. The pot you fried your chips in most probably needs a good clean, right? Well not to worry, pop some vinegar in your pot and put it on the burner on a low heat, gently sprinkle in some Bicarbonate of soda and give it a minute to react. Let the pot cool for a few minutes and with one finger, your least effort and your eyes closed give the pot a wipe. Super easy and kind of fun. Make it interesting, get your kids to give you a hand and put some goggles and an apron on them, play it out like a science experiment. Proceed to the bathroom and let them ‘play’. Unclog your shower drain with a vinegar and bicarbonate mixture. Practically salt and vinegar, this combination will power through your drains and completely lift any grime that has accumulated in time. 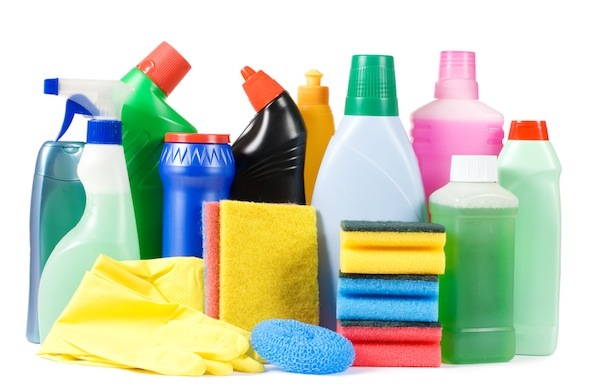 Even though your cleaning products should not be causing so much impact on the environment, their residue might still cause unpleasant blockages. Try reusing your spray bottles, you know the ones made from plant; previously containing your plant based sprays, fill them up with water and about 20 drops of Lavender Essential Oil for the bedroom and Eucalyptus Essential Oil for the Living Room. The Lavender acts as a calming therapy and helps you to get to sleep faster while the Eucalyptus keeps your pets off your landlord’s sofa. That’s a natural air freshener for you, make it organic and buy Organic Essential Oils - they’re worth the extra pennies.